Vowel digraphs are vowels written with two letters. Some are a single sound. Others, like ‘au’ or ‘oi,’ are 'diphthongs', in which the combination contains the basic sounds of both vowels, but they glide together.) Here are some suggestions for sounding them out in unfamiliar words. 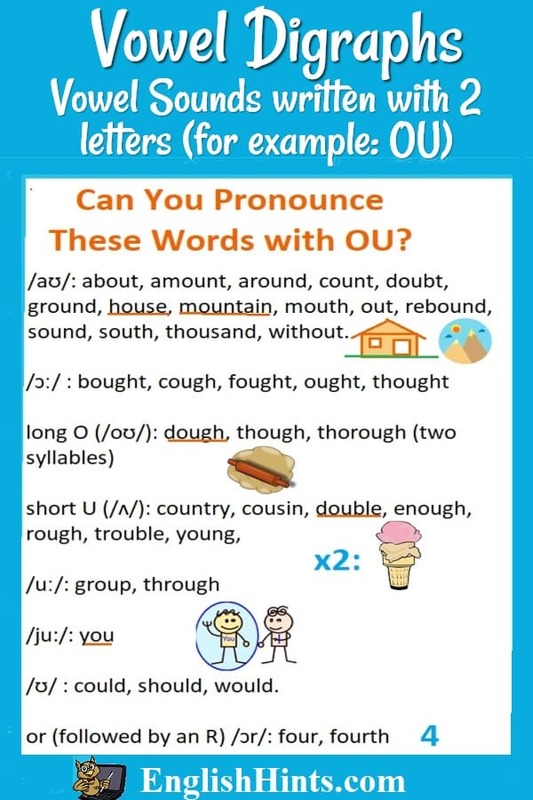 Learning how vowel digraphs are pronounced and spelled in English can improve your reading comprehension as well as your pronunciation and spelling. bait, bay, brain, daily, fail, laid, maid, may, paid, pay, praise, raise, say (but NOT said-- it rhymes with red), wait, way. audio, auditorium, auto, autumn, awful, cause, caught, daughter, raw, saw, taught. bean, cheat, dream, each, heal, lead (the verb), leave, mean, reach, real, speak, team, treat. already, bread, breakfast, dead, head, instead, lead (grey substance used in plumbing), measure, ready, spread, weather. There is no certain way to predict which pronunciation a word will use. bee, deep, feed, feel, free, need, see, seed, steep, tree. eight, neighbor, weigh, OR with a long E (/iː/ ) after C: deceive, receive. boast, boat, coat, goal, soap, throat. boil, boy, point, soil, toy. book, good, look, stood, took, understood. OU may be the most difficult digraph to guess. about, amount, around, count, doubt, ground, house, mountain, mouth, out, rebound, sound, south, thousand, without. blow, grow, know, low, own, show, throw. See also Short or Long English Vowels for the most common single (and occasionally double) letter vowel sounds in English, and Consonant Digraph Sounds for consonant digraphs. A good way to learn how these digraphs sound in spoken in English is to listen to a speech or podcast that has a transcript you can read while you listen. Check out English Listening Practice. Try Carol Dweck's short TED talk on that page: "The Power of Yet (Believing that you can improve)." She talks about the importance of a growth mindset: confidence that practicing difficult skills can make you smarter, rather than just prove you are a failure. I found 22 vowel digraphs in the first two minutes, or neatly 60 in all, almost all mentioned in the pronunciation list above. For a more detailed explanation of digraphs and other English vowel sounds, along with practice activities, see the EnglishHints Academy course on Vowel Sounds and Spellings. ESL Phonics gives the basic sounds of each letter. as well as linking to pages with in-depth explanations of vowel sounds and of vowel and consonant digraphs.